Check out the Dollar General Ad Scan here! There’s a NEW Dollar General Clearance Event, Friday 3/1 – Sunday 3/3! 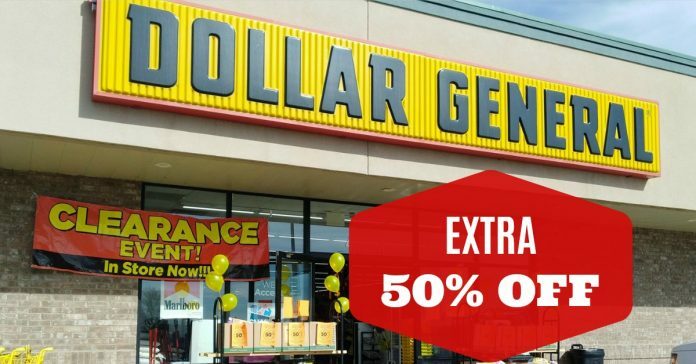 Head to Dollar General to get 50% Off Clearance Prices. The Dollar General Clearance Event is an easy way to get HOT Dollar General Clearance Deals! Remember that Dollar General allows you to use manufacturer coupons on any clearance items to maximize savings! See what’s included in the Dollar General Clearance Event (& all the details) below! Thanks to Smartqponclips for all the details! See store for details. Not valid with any other offers. Discount applied at register. Good luck in your Dollar General Clearance Event hunting! **Please note that this Dollar General Clearance Event may vary by location or region. Previous articleEnchantimals Bree Bunny Doll – Low Price Alert! Take an additional 50% off already reduced clearance prices including Clearance Section merchandise, Items with orange sticker, Yellow Dot Apparel, White Star Socks, Seeds, Summer BBQ, and select As Seen on TV items. Take 50% off regular prices on White Dot Apparel, Spring & Summer Home Goods (Red/Green Dots), Swim/Summer Toys, Planters, Lawn Décor, Fencing, Patriotic, Lawn Furniture, Watering, Tools, Grill Accessories, Yard Care, Solar and Lighting, Birdfeeders, Wind Chimes and Citronella.